"White Man's Best Friend" is on sale through Nov. 6 at NYC's Protest Factory. Barbara Kruger, the New York conceptual artist whose work deftly sheds light on issues ranging from feminism to consumerism, is launching a new T-shirt project in collaboration with Downtown for Democracy and Performa, the New York-based arts organization actively exploring the connection between live performance and contemporary art. The shirt is a wearable reinterpretation of an original piece of Kruger's from 1984, Untitled (White Man's Best Friend), a project co-organized by Job Piston, Performa's special projects manager, on the occasion of the Protest Factory event launching today and going through November 6. (This project, by the way, marks the second collaborative union between Performa and Kruger, who, last year, launched streetwear, billboards, and street art in the style of large-scale advertisements, relying on bold captions that were widely thought to critique notions of trend its relationship to modern capitalism.) The new shirt, which features a print of the original work's black-and-white image of America's Supreme Court, includes the stark text overlay of "White Man's Best Friend," which can be interpreted literally as the oppressing power that would allow Brett Kavanaugh to be appointed Supreme Court Justice, or figuratively, as the white-majority legal system as the master of white men. In terms of the Protest Factory event, it is being billed as a "multi-functional political happening" organized by Downtown for Democracy, that is "equal parts: exhibition, reading series, artist studio, and campaign headquarters." There, the shirts will be on sale. Monies raised at the event, held in partnership with Swing Left and ad campaigns aimed at voters aged 18-35 in swing districts in Texas and New York, will be donated to grassroots efforts encouraging progressive voting, just in time for the upcoming midterm elections. Participating artists include Marilyn Minter, Juliana Huxtable, Richard Hell, Ryan McGinley, Viva Ruiz, Cecily Brown, Nan Goldin, Michael Cunningham, and many more. The event will take place at Jeffrey Deitch's project space at 18 Wooster Street in downtown Manhattan. More information can be found here. 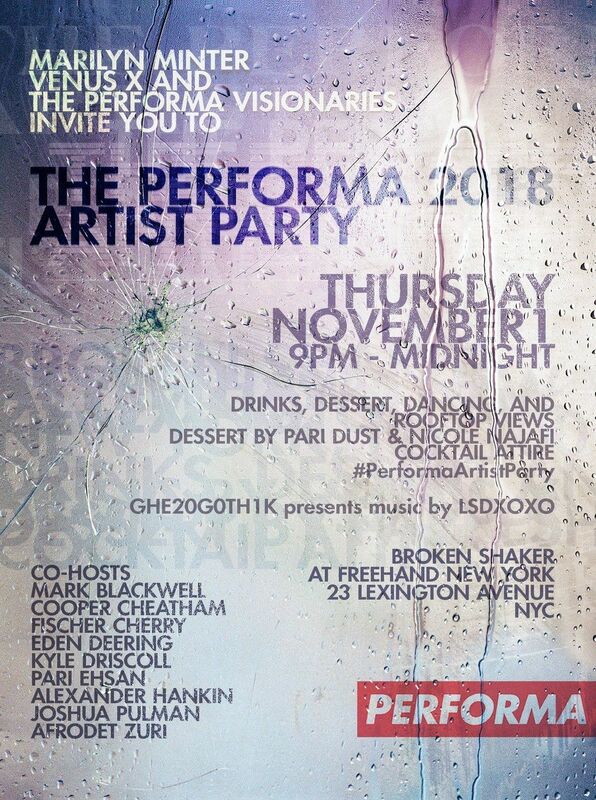 Once you've rallied at the Protest Factory and procured your politically themed Barbara Kruger T-shirt, head to Performa's Artist Party tomorrow at Freehand Hotel's Broken Shaker rooftop bar, co-hosted by Marilyn Minter and Venus X. LSDXOXO will be playing. Flyer with all details is below. See you there!